aspects of the banding patterns. Difficulties encountered as a result of local variations in banding pattern can occur depending on the strain of fly, puff formation, and the intensity of staining that can obscure finer banding and doublets. Other phenomena such as ectopic pairing, asynapsis, excessive stretching, and specific regions varying in stage of constriction also create variable patterns (6). The easiest way to begin to identify the chromosomes is to resolve the banding patterns of the telomeric ends of the chromosomes and then look for additional landmarks as described by Bridges (2) and Lefevre (9). Generally, these landmarks are puffs, constrictions, and uniquely shaped or banded regions. The telomeric ends of each of the chromosome arms excepting the dot chromosome are presented in Fig. 3 as a simple way of first identifying each chromosome (see also Chapter 12). 1. Higher temperatures (20-25°C) may be required for culture of specific strains of flies. Fig. 3. 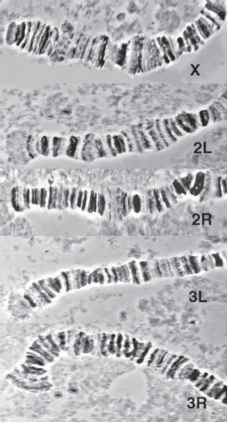 Telomeric ends of the X chromosome, left and right arms of the second chromosome (2L, 2R), and left and right arms of the third chromosome (3L, 3R). Orcein stained chromosomes observed at 1000x using phase contrast (reduced from original magnification). 2. Forty-five percent acetic acid is preferred because dissection in salines is known to induce additional puffing in chromosomes. 3. The use of transmitted light from an opaque reflecting surface below the microscope stage allows for stronger contrasts such that the slightly translucent glands are distinctly visible. The fat bodies appear as dark opaque sheets of tissue. 4. The glands appear as two long, slightly translucent sacs that connect to a common tube near the mouth. Large sheets of fat tissue may be connected laterally. Do not use the glands if they shrink on fixation or become grainy in appearance or damaged in removal. 5. 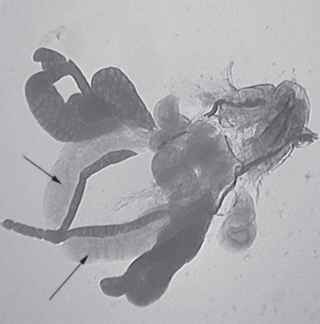 If a permanent spread is being made, the squash is made on a subbed slide or a commercially available Probe-On-Plus slide (Fisher) to which tissues adhere. 6. Squashes may be made directly in the stain, thus allowing for further staining. Squashing in fixative provides a cleaner background. 7. In order to remove the cover slip for a permanent spread, use siliconized cover slips. Allow slides to sit at room temperature for several hours and then freeze by dipping in dry ice-ethanol bath for 1 h. Flip off cover slip with razor blade and place slide in 95% ethanol (room temperature) for 5 min and then in 100% ethanol for 10 min. Seal a cover slip over preparation with Permount. 1. La Cour, L. F. (1941) Acetic-orcein: a new stain-fixative for chromosomes. Stain Technol. 16, 169-173. 2. Bridges, C. B. (1935) Salivary chromosome maps with a key to the banding of the chromosomes of Drosophila melanogaster. J. Hered. 26, 60-64. 3. Nicoletti, B. (1959) An efficient method for salivary gland chromosome preparation. Dros. Inform. Serv. 33, 181-182. 4. Ashburner, M. (1989) Drosophila, A Laboratory Manual, Cold Spring Harbor Laboratory, Cold Spring Harbor, NY, pp. 28-32. 5. Pardue, M. L. (1994) Looking at polytene chromosomes, in Methods in Cell Biology (Goldstein, B, L. S. and Fryberg, E. A., eds. ), Academic, San Diego, CA, Vol. 44, pp. 333-370. 6. Richards, G. (1985) Polytene chromosomes, in Comprehensive Insect Physiology, Biochemistry and Pharmacology (Kerbut, G. A. and Gilbert, L. I., eds. ), Pergamon, Oxford, Vol. 2, pp. 255-300. 7. Zhimulev, I. F. (1996) Morphology and structure of polytene chromosomes, in Advances in Genetics (Hall, J. C. and Dunlap, J. C. eds. ), Academic, San Diego, CA, Vol. 34, pp. 260-280. 8. Sturtevant, A. H. and Novitski, E. (1941) The homologues of the chromosomal elements of the genus Drosophila. Genetics 26, 517-541. 9. Lefevre, G., Jr. (1976) A photographic representation and interpretation of the polytene chromosomes of Drosophila melanogaster salivary glands, in The Genetics and Biology of Drosophila (Ashburner, M. and Novitski, E., eds. ), Academic, New York, pp. 31-66. 10. Sorsa, V. (1988) Electron microscopic mapping of polytene chromosomes, in Chromosome Maps of Drosophila, CRC, Boca Raton, FL, Vol. II, Ch. 16, pp. 29-107. 11. Sorsa, V. (1988) Polytene maps of Drosophila, in Chromosome Maps of Drosophila, CRC, Boca Raton, FL, Vol. 1, Ch. 14, pp. 155-194. 12. Bridges, C. B. (1938) A revised map of the salivary gland X-chromosome of Drosophila melanogaster. J. Heredity 29, 11-13. 13. Bridges, C. B. and Bridges, P. N. (1939) A new map of the second chromosome: a revised map of the right limb of the second chromosome of Drosophila melanogaster. J. Heredity 30, 475-476. 14. Bridges, P. N. (1941) A revised map of the left limb of the third chromosome of Drosophila melanogaster. J. Heredity 32, 64-65. 15. Bridges, P. N. (1942) A new map of the salivary gland 2L-chromosome of Drosophila melanogaster. J. Heredity 33, 403-408. 16 Ashburner, M. (1972) Puffing patterns in Drosophila melanogaster and related species, in Developmental Studies on Giant Chromosomes (Beerman, W., ed. ), Springer-Verlag, New York, pp. 101-151. 17. 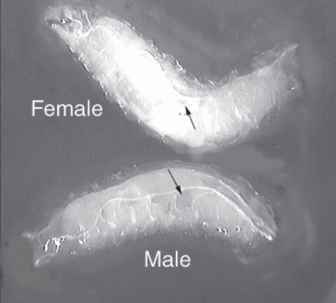 Lindsley, D. L. and Grell, E. H. (1968) Genetic variations of Drosophila melanogaster. Carnegie Institution of Washington Publication No. 627.